Handbook of the Economics of Population Aging, Volume 1A, provides the economic literature on aging and associated subjects, including social insurance and healthcare costs. This text explores the economic literature on aging and associated subjects, including social insurance, health care costs, the interests of policymakers, and the role of academics. 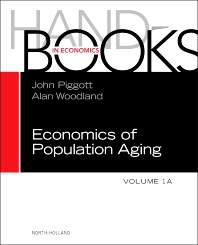 As the first of two volumes, users will find it a great resource on the topics associated with the economics of aging. Together with its companion, volume 1B, this work includes literature that has appeared in general economics journals, in various field journals in economics, especially, but not exclusively, those covering labor market and human resource issues, information from interdisciplinary social science and life science journals, and data presented in papers by economists published in journals associated with gerontology, history, sociology, political science, and demography, amongst others. John Piggott is Director of the ARC Centre of Excellence in Population Ageing Research (CEPAR), and of the Australian Institute for Population Ageing Research at the University of New South Wales, Australia, where he is Scientia Professor of Economics and also holds an ARC Australian Professorial Fellowship. He serves as book review editor of the Cambridge journal, the Journal of Pension Economics and Finance, as an Associate Editor of the Journal of the Economics of Aging, and has recently been appointed to the editorial board of the Journal of Retirement. Alan Woodland is currently Scientia Professor of Economics and ARC Australian Professorial Fellow in the School of Economics within the Australian School of Business at the University of New South Wales. He was previously Professor of Econometrics at the University of Sydney and Professor of Economics at the University of British Columbia, Canada. He is a Fellow of the Econometric Society, a Fellow of the Academy of the Social Sciences of Australia and the recipient of the Distinguished Economist Award of the Economics Society of Australia. He was previously a member of the Council of the Econometric Society, Chair of the Econometric Society Australasian Standing Committee and a member of the Executive Committee of the International Economics Association.